The early instars of this Caterpillar are off-white, but later instars become nearly black. The caterpillar is inclined to rest a rest along a twig. The caterpillar pupates in a sparse cocoon in ground debris. Cassia species ( CAESALPINIACEAE ). 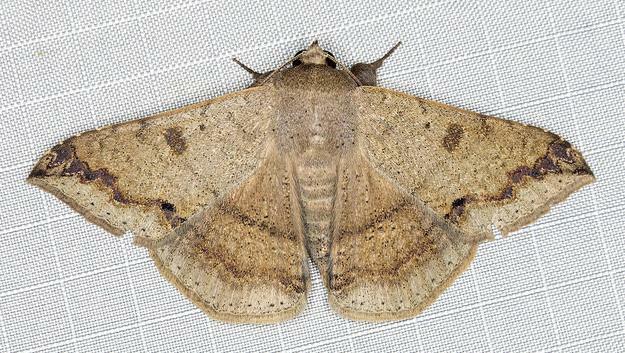 The adult moth of this species has variable patchy brown wings, each with a wiggly dark submarginal band. The forewing tips are pointed and recurved. Th wingspan is about 5 cms. LeapFrogOz, Kuranda, 2015, p. 136. Part 14 (1858), p. 1512.